Politics is always a reaction to something. No one campaigns on the promise to do nothing — everyone asks for votes in return for promising to fix what’s broken. The economic and financial calamity of 2007 to 2009 has now shaped American politics for more than a decade. Just as the Great Depression of the 1930s defined political parties, their presidential nominees, and policies until at least the 1980s, the calamitous conclusion of the George W. Bush presidency foretold the future for the decade that has already occurred and decades more to come. Academics have pretty well diagnosed the trouble. It had two parts. First, from 2002 to 2008 bad government policies and worse business practices produced a huge inflation in housing prices and mortgage debt. When the bubble began to pop in 2007, households that saw their home equity wealth evaporate began to save instead of spend, and lenders that saw a trillion dollars of security disappear cut back on credit. Every perceptive observer knew by early 2008 that a recession was coming. Second, scandalously unregulated financial practices tied American and European financial institutions in a web of borrowing and lending that was suspended on nearly imaginary assumptions. The products on which numerous large firms depended had little connection to durable value. One after another, starting in 2007 and running to 2008 in the United States, 2010–11 in Europe, huge companies suffered runs that drove them into forced sales, forced government bailouts, or bankruptcy. 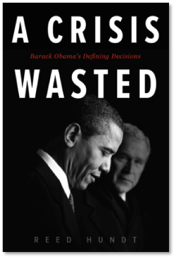 My book, A Crisis Wasted: Obama’s Defining Decisions, is the tragic tale of the government response to the troubles. Obama himself is a heroic figure in American history. We know how his two terms, marked by intelligence and integrity, ended. The single worst person in the country from Obama’s perspective — a man who had championed the cruel hoax that Obama was an illegitimate president because he was born in Kenya, and who campaigned on the promise to repeal everything Obama had done — succeeded him as president. What also calls out for recognition is that the response to the economic troubles of the Bush and Obama teams, who worked in concert from September 2008 to January 2009, fell far short of what the American people needed to cope with their problems. One out of ten households lost their home. Nine out of ten have seen little to no wealth or income increase in more than a decade. Student indebtedness has become the single biggest drag on prospects for young people, and now discourages most people under 30 from seeking advanced education. Affordable health care remains a problem for most people who need it, and less than 10% have been added to the rolls of the insured since the Affordable Care Act was passed in 2010. With the failure to pass any significant energy legislation for more than ten years, the United States is neither winning the battle against catastrophic climate change, nor leading in the switch from carbon to clean power platforms. This litany of disappointment injected huge volatility in American politics (as it also did in Europe and China). The middle class became unmoored from allegiance to either political party. Donald Trump saw this as opportunity, more clearly and more quickly than anyone else. He had his chance and he took it. His base is the disappointed, disaffected, and distressed: these households are right that the government’s response to the troubles of 2007–9 let them down. They may not have in Trump a problem-solver, but they are not wrong that they have problems that were not adequately addressed in 2008–9. On the Democratic side every candidate for president in 2019 is running, explicitly or not, on a platform that repudiates the policies of Democratic candidates from the late 1980s to 2016. Sanders in 2016 was an exception, but of course he was a self-styled socialist. Neoliberalism was the big ideological tent of ideas for all Democratic leaders from the Dukakis defeat. Its failures of diagnosis and remedy in 2008–9 have extinguished its usefulness. All Democratic nominees now pursue votes with policies that directly or indirectly reject the antidotes applied to the economy in the winter of 2008–9. In sum, deficit worry is out, public spending is in; private investment is distrusted, public-private investing is needed; infrastructure didn’t matter, now we need high voltage transmission and high speed rail; private health care insurance is insufficient, expanded Medicare/Medicaid is vital; housing wealth is unreliable, personal savings accounts necessary; education markets don’t deliver, low cost or free education is the future for young people. Right or wrong, every policy now advanced by Democrats rejects the neoliberal nostrums that guided the Bush-Obama decisions of the winter of 2008–9. In a distorting crazy mirror, the pitches of the all-too-effective incumbent president are also totally reactive to the decisions of that dire season a decade ago. If history is a guide, it’s important to decode why and how well-intentioned, super-smart people took the measures made in the crisis that ran through the presidential election of 2008. If the future is to be foretold, and improved, we the voters will hope for different ways of going about the business of deciding what to do. A Crisis Wasted Launches April 2. Learn more here.